We are back from the TNNA trade show in Long Beach and wanted to share a new project we are beginning. We are going to have a year long series of kits...a new one each quarter...that combine our yarn with yarn from Lorna's Laces. 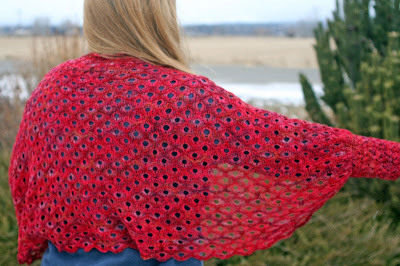 This idea was well received by the yarn shop owners attending the trade show and they were excited about the idea that knitters could try yarns from both companies all in one project. 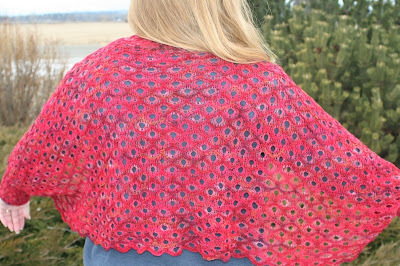 The first kit will be shipped to stores as of February 1st and will be a beautiful shrug that combines our Half Crepe with Helen's Lace from Lorna's Laces. It is available in 5 color combinations (our yarn colorways will be Ruby River, Chinook, Evergreen, Yellowstone and Moondance and these will combine with coordinating yarn from Lorna's). The beginning of May we have a sock kit designed by Cat Bordhi, then the third quarter we will have a vest designed by Ginger Luters. The fourth project is still in the works. We hope you love this shrug as much as we do!! It is soft, full of drape, light weight and elegant!! What a fabulous idea! I can't wait to see them. Now I'm off to check out the colorway options. And then to check with my LYS to see if she's got them on order. I can't wait to see the sock kit and whatever else you have in store later in the year! One of these days I'll make it down to the dye studio. For goodness sake I'm in Missoula. It's just that pesky day job that gets in the way. Come see us at Stitches West!! !